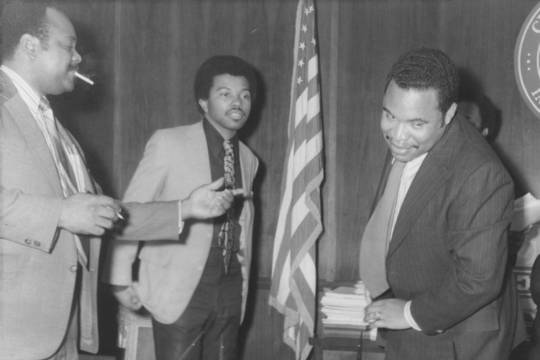 Donald Tucker, Junius Williams, and Ken Gibson chat in the Mayor's office in the early 1970s. One way to look at the life of former Newark Mayor Ken Gibson is how he faced a challenge not on Broad Street, but along the boardwalk. "When Ken lined up to run the Jersey Shore Marathon in January 1976, it was four degrees outside, with 30 mile-an-hour winds coming down from the north on to the course by the ocean," said Dan O'Flaherty, a Columbia University economics professor and Newark native who served as Gibson's aide during his mayoral tenure. "He had to run 13 miles into the wind, then back. I thought that he had no chance of finishing it. But he did." Gibson's lesser-known athletic exploits are a parable for the politics for Newark's first African-American mayor, who died on Friday at the age of 86. Gibson's election in 1970 was a seminal moment in the middle of a seismic shift in Newark's history. The wounds of the 1967 riot that nearly destroyed the city's body politic were still seeping, the scar tissue not fully formed. For four terms, Gibson was compelled to perform the Lazarus-like task of bringing the city back from its near death. How he did it was with a personality that gave off no blinding light, and with policies that offered no miraculous resurrection. Instead, he tried to revive Newark slow and steady, step by step, brick by brick. Gibson, an engineer by trade, was an unlikely architect of an electoral revolution that would put African-Americans in control of City Hall. But Junius Williams, Newark's official city historian, saw up close the support base that Gibson was building to challenge then-Mayor Hugh Addonizio. "When Ken ran for mayor in 1966, nobody thought he was going to get anything. But the idea of a black mayor propelled 15,000 people to vote for him," said Williams, the founding director of the Abbott Leadership Institute at Rutgers University-Newark, who served as Gibson's first campaign manager in 1970. "After that, Ken had it in his mind that he was going to run for mayor next time, and that he was going to win. He had that kind of stubbornness and temerity." The contrast between Gibson and some of the more fiery players in the Newark political scene worked to help him defeat Addonizio in the 1970 mayoral election, despite his rival's best efforts. "Addonizio based his campaign on Amiri Baraka. He claimed that because Baraka was a racist, and he supported Gibson, Gibson was a racist, too," Williams said, underscoring the impact that the prominent poet and black nationalist activist, the father of current Mayor Ras Baraka, had on Newark politics at the time. "Ken didn't renounce the support of Baraka, he couldn't afford to do that," Williams said. "But Ken also had a relatively conservative approach and wanted to take small steps to move the city forward. In this way, he gained the trust of the downtown business leaders and of some of the whites who remained in the city. If Baraka was the bogeyman, Ken might not be the savior, but he was better than the alternative." "There was that Clark Gable-looking George Richardson, Earl Harris, the fox, and Harry Wheeler, who could sell snow balls to the Eskimos," said former Newark Mayor Sharpe James, listing several of Gibson's potential rivals at the time he joined Gibson's 1970 mayoral ticket as the South Ward council candidate. "Ken might not have been the political choice, but he was the community's choice," James said. "Everyone thought that when Ken got elected, there would be a team of mayors. But Ken just flashed that cheeky smile of his and went to work. He pulled a trick on all of us." According to Richard Roper, co-editor of the soon-to-be-published book A Mayor for All the People: Kenneth Gibson's Newark, building a better Newark was not going to be easy. "Ken Gibson faced a serious budget deficit, a heavy out-migration of middle-income black and white residents, along with large industrial and commercial components of the city's economy on the cusp of disappearing," said Roper, noting the type of problems faced by many American cities at the time, made worse by the fiscal mismanagement and malfeasance of Addonizio, who was ultimately convicted for his part in a contracts kickback scheme. "But he suggested that if he confronted challenges over time, positive change could be created." O'Flaherty noted the projects completed under Gibson's watch that helped to stabilize the city - the new PSE&G headquarters building, the Gateway office tower complex, and the expansion of Newark Airport. Numerous non-profit organizations that are important parts of Newark's landscape - The North Ward Center, Ironbound Community Corporation, Unified Vailsburg Services Organization - got key early support from the Gibson administration. "The building that went on when Gibson was mayor was way more than went on when Cory Booker was mayor," O'Flaherty said, contrasting Gibson's record with that of the current U.S. Senator and Democratic presidential candidate, who served as Newark's mayor from 2006 to 2013. "Gibson also shrunk the size of city government, which enabled the property tax burden to come way down, helping stable neighborhoods like the Ironbound and the North Ward," O'Flaherty said. "Right across the river, New York City had almost gone bankrupt and had essentially defaulted. In Newark, the same type of problems were dealt with, and dealt with responsibly." Dealing with Newark's myriad problems ultimately wore Gibson down. He would lose to his protege James in the 1986 mayoral election. "He burned out. His 16 years in office were really like 30. We stood on Ken's shoulders for 16 years, and we wore Ken out," James said. "When I ran against him, my wife said I wouldn't win. But during the debates, I sensed that he'd had enough. I get it. After 20 years in office, I got tired, too." Life after politics also did not leave Gibson unmarked. He was indicted on federal charges of bribery involving a school construction project in Irvington in 2000. As part of an agreement that spared him jail, he pleaded guilty to tax evasion two years later. Guy Sterling, a former Star-Ledger reporter, believes that Gibson's legal problems aren't going to be the first thing people remember about his legacy. "He was loyal to people in his corner, maybe too loyal," Sterling said. "People came at him hard, but at the end, he was beyond that. I spoke to him shortly before he passed on, and he bore no grudges. In this business, that's an achievement, and an indication of why he was the right guy at the right time." "You have to remember that many of the white people working in City Hall in the 70s and the 80s were left over from Addonizio. They had to learn to be comfortable in a new situation where they were the minority and had black bosses. On the other side, black people in Newark had no experience being bosses," O'Flaherty said. "Ken made them all comfortable. This was a guy whose official vehicle was an old Checker cab. Absolutely practical. Absolutely no pizzazz. Just get in the cab, and let's talk." James remembers the day after he beat Gibson as the day when he began to get what Gibson meant to the city. "He calls me into his office and says go get your suitcase - we're going to Puerto Rico. I'm talking you to the U.S. Conference of Mayors meeting in San Juan. I'm going to teach you how to be a good mayor, damn it," James said. "Ken Gibson brought African Americans like me who had never been inside of City Hall, except to pay a bill, and brought us into power." "We were a majority people being treated like a minority, and we were going to show them at the polls that it was about one man, one vote. That was our power," James said. "Times change, and cities change. The Hispanics are challenging us now, like we had to challenge the Irish and the Italians. But in 1970, without Ken Gibson, we couldn't win. He made people go to the polls and vote who never dreamed of voting because they didn't think it meant anything. He proved that we counted. He proved that we meant something." Gibson will lie in state on Thursday, April 4, at Newark City Hall, located at 920 Broad Street, in the Rotunda Room from 12 noon to 6 p.m.. Funeral services will follow at Newark Symphony Hall, located at 1020 Broad Street, at 7 p.m.